Saturday, May 3rd marks World Press Freedom Day 2014. This event, organized by UNESCO, presents a wonderful opportunity to reflect on the importance of free press and intellectual freedom, and the great impact that these issues have on creating a world with just and corruption-free governance. The role of journalism is to bring issues of government, culture, science, environment, and society into the public light – to inform the people and hopefully to spark dialogues that include the diverse public into the process of shaping public policy. A UNESCO press release explains that a free news media not only helps in policy shaping but also leads to the reduction of poverty through intellectual empowerment and increased mobility of groups that can be disproportionately affected by poverty, such as women and youth. In order to provide this service, journalists and the news media need to be free to report the news truthfully. In many places around the world, journalists do not have this freedom. UNESCO reports that journalists face obstacles including censorship, arrest, and even threats of physical harm and death. It is the goal of organizations such as Reporters without Borders, Committee to Protect Journalists, the International Federation of Journalists, and many more, to protect the rights of journalists and raise awareness about the threats to press freedom that exist in the world. 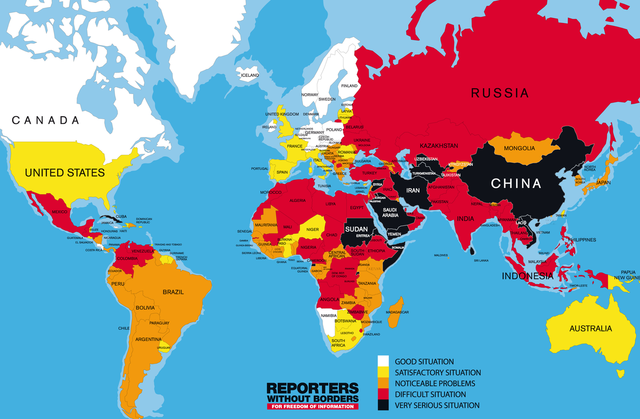 Reporters Without Borders’ World Press Freedom Index 2014 ranks countries based on pluralism, media independence, environment and self-censorship, legislative framework, transparency, and infrastructure. The United States has fallen thirteen places on the list in the past year, currently residing in 46th place. This change is largely due to the government’s efforts to increase security and track down whistleblowers and leaks. These actions by the government, according to Reporters Without Borders, inhibit journalists from revealing information to the public that may be in the interest of the public good. Other countries have fallen on the list because of armed conflict. These countries include Lebanon and Iraq (due to the conflict in neighboring Syria), and Mali, the Central African Republic, and the Democratic Republic of Congo (due to the activities of guerrilla and terrorist groups in the region). In some cases, organized crime is a danger to journalists and has caused a decline in press freedom in certain countries, most notably Honduras, Guatemala, Brazil, and Paraguay. Increasing press freedom is a major goal of the UN’s Post-2015 Development Goals. Article 19 of the International Covenant on Civil and Political Rights states, “Everyone shall have the right to freedom of expression; this right shall include freedom to seek, receive and impart information and ideas of all kinds, regardless of frontiers, either orally, in writing or in print, in the form of art, or through any other media of his choice.” The 1949 Geneva Conventions and the 1977 Protocols Additional 1 and 2 to the Geneva Conventions also include provisions for press freedom. These international agreements create a powerful impetus for countries around the world to keep striving for greater press freedom and to keep assessing the ways that journalists and reporters are treated. ARTICLE 19 is an international human rights organisation which defends and promotes freedom of expression and freedom of information all over the world. The Ethical Journalism Initiative website is a new campaign to rekindle old values in media worldwide, launched by the International Federation of Journalists. The Inter American Press Association (IAPA) is a press advocacy group representing media organizations in North America, South America and the Caribbean. The International Freedom of Expression eXchange (IFEX) is a global network of around 90 non-governmental organisations that promotes and defends the right to freedom of expression. The International News Safety Institute (INSI) is a coalition of news organisations, journalist support groups and individuals exclusively dedicated to the safety of news media staff working in dangerous environments. International Press Institute is the global network of editors, media executives and leading journalists, dedicated to freedom of the press and improving the standards and practices of journalism. Policinski, G. (2012). A Free Press? It’s Not That Simple. Insights On Law & Society, 12(3), 4-7. Czepek, Andrea. ; Hellwig, Melanie; Nowak, Eva. (Eds.) (2009). Press freedom and pluralism in Europe :concepts and conditions. Bristol, UK: Intellect. Price, Monroe E.,; Abbott, Susan; Morgan, Libby. (Eds.) (2011). Measures of press freedom and media contributions to development: evaluating the evaluators. New York : Peter Lang. Siegel, Paul. (2014). Communication law in America. Lanham, Md. : Rowman & Littlefield. Smith, Dean C.. (2013). A theory of shield laws :journalists, their sources, and popular constitutionalism. El Paso : LFB Scholarly Publishing LLC. Wasserman, Herman. (Eds.) (2013). Press freedom in Africa :comparative perspectives. London : Routledge. Water scarcity is one of the most pressing humanitarian crises facing the world today. Access to water resources has far-reaching political and social implications, especially in areas where water is scarce. Natural water basins do not comply with man-made political borders, and as a result the allocation of precious water resources becomes a point of negotiation in transnational treaties and agreements. Adding to the politicization of water is the connection between water and energy production. Water is needed for all types of energy production, and energy is needed for the extraction and dissemination of clean water (UNIDO, 2014). Water also affects social and cultural issues, such as gender and income inequality. Since women are traditionally the family members responsible for the retrieval of water, women end up spending many hours of their day collecting water (many times still from polluted or unclean sources) for their family’s survival rather than working outside the home or pursuing education. When people must spend such a large portion of their time procuring basic resources such as water, their ability to better their situation through work or education becomes even more limited. This means that the poorest people in the world remain poor, as long as they are struggling daily to obtain water. Probably the most heart wrenching aspects of the global water crisis is its disproportionate effect on children. Unicef reported in 2013 that over 2,000 children die every day from diarrheal diseases, an estimated 1,800 of which stem from issues of water and hygiene. Sanjay Wijesekera, global head of UNICEF’s water, sanitation and hygiene programme, puts these numbers into perspective, saying, “The numbers can be numbing, but they represent real lives, of real children. Every child is important. Every child has the right to health, the right to survive, the right to a future that is as good as we can make it” (UNICEF, 2013). The UN’s Millennium Development Goals address the issue of clean water and sanitation. Target 7.C of the goals promises to, “Halve, by 2015, the proportion of the population without sustainable access to safe drinking water and basic sanitation” (UN, 2013). According to the UN website, this goal was met in 2010, five years ahead of schedule. More than 2 billion people gained improved access to drinking water between 1990 and 2010. How are these goals being met? 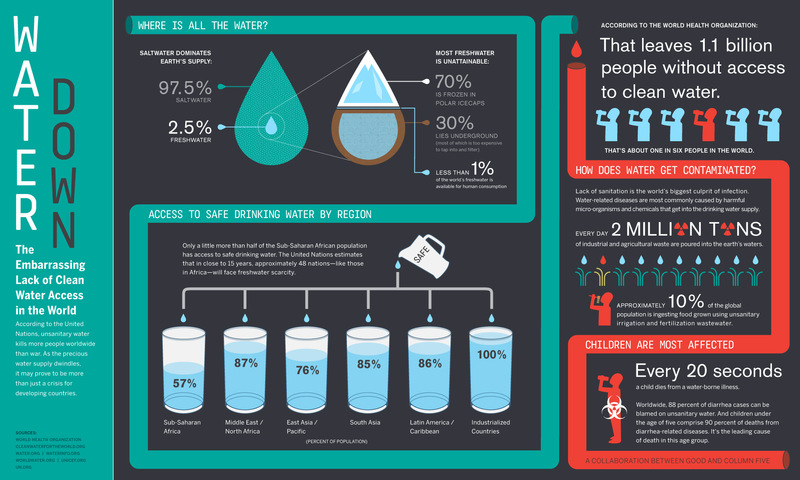 In addition to awareness campaigns such as World Water Day (which happens to be coming up on March 22nd! ), there are countless organizations working to provide clean and accessible drinking water to the world’s poor and to manage and conserve freshwater resources. Many organizations work to set up programs in water-scarce countries that provide financing to families and communities for setting up clean water and sanitation services. Others directly provide wells, pumps, and latrines, as well as training for community members on maintaining the clean-water technology. Organizations range from non-profits to institutional coalitions to for-profit companies that donate a portion of profits to the cause. These types of charities and organizations are making strides in bringing safe and clean water to world populations, but it is a massive undertaking and the effort will require cooperation across cultures and political borders. Ciampi, M. (2013). ‘Water divide’ in the global risk society. International Review Of Sociology, 23(1), 243-260. Lall, U., Heikkila, T., Brown, C., & Siegfried, T. (2008). WATER IN THE 21ST CENTURY: DEFINING THE ELEMENTS OF GLOBAL CRISES AND POTENTIAL SOLUTIONS. Journal Of International Affairs, 61(2), 1-17. Sivakumar, Bellie. (2011). Water Crisis: from conflict to cooperation, an overview. Hydrological Sciences Journal. 56(4), 531-552. Trottier, J. (2008). Water crises: political construction or physical reality?. Contemporary Politics, 14(2), 197-214. Allan, J. A. (Eds.) (2013). Handbook of land and water grabs in Africa: foreign direct investment and food and water security. London : Routledge. Chellaney, Brahma. (2013). Water, peace, and war :confronting the global water crisis. Lanham, Md. : Rowman & Littlefield Publishers. Groenfeldt, David. (2013). Water ethics: a values approach to solving the water crisis. Abingdon : Earthscan from Routledge. Hughes, Richard. (2013). Religion, law, and the present water crisis. New York : Peter Lang. Thielbörger, Pierre.. (2013). The right(s) to water: the multi-level governance of a unique human right. Berlin : Springer. The latest Social Science Report from UNESCO, released on November 15th, highlights the changing global environment and the impact that environmental changes have on social, economic, and political issues. The report highlights the need for in-depth research on environmental changes from a social science perspective, pointing to three “defining attributes” of modern global issues that particularly require the attentions of social science researchers. These three attributes are “The inseparability of social and environmental systems and problems,” “A human condition without precedent,” and “Urgent and fundamental social transformation.” With the goal of creating a basis for social science research in the field of environmental change, and spurring increased interest in the area among the social science community, the report includes perspectives from 150 authors from a variety of disciplines. Although social scientists have been studying global environmental change since the 1950s, the field is still mostly dominated by natural science research. Asserting that the complex issue of environmental change requires a cross-discipline approach, the authors of the World Social Science Report call for the integration of global change research from around the world into an international multi-disciplinary research campaign. * The argument is that “global change changes everything.” Humans rely on the natural resources that the Earth provides, and changes in the natural world present very real and pressing challenges for humanity, challenges which require a broad perspective that draws on wisdom from many different disciplines. The most effective way to understand and navigate major global issues like environmental change is through a collaborative, multi-disciplinary approach to research and development. Hopefully this report will be an effective motivator for members of the social science community to tackle the issues surrounding global environmental change and to reach out to other disciplines to form collaborative partnerships and launch new paths of research on the subject. * One organization, Future Earth, is attempting this integration through an alliance of international organizations that will endeavor to find solutions to global change issues. Want to learn more about global environmental change from a social science perspective? Here are some great sources on the topic! Bradatan, Cristina. (2013). Where do we go from here? Climate change as a human affair. International Sociology. 28, 496. Ehrlich, Paul R.. (2011). Seeking environmental solutions in the social sciences. Bulletin of Atomic Scientists, 67(5), 1-8. Lahsen, Myanna. (2013). Climategate: the role of the social sciences. Climatic Change, 119(3-4), 547-558. Moss, R. H., Edmonds, J. A., Hibbard, K. A., Manning, M. R., Rose, S. K., van Vuuren, D. P., & Wilbanks, T. J. (2010). The next generation of scenarios for climate change research and assessment. Nature, 463(7282), 747-756. Almlund, Pernille., Jespersen, Per Homann, Riis, Søren. (Eds.) (2012). Rethinking climate change research: clean-technology, culture and communication. Farnham, Surrey, England ; Ashgate Pub. Co.
Driessen, P, P. J., Leroy, Pieter, Vierssen, Wilhelmus van. (Eds.) (2010). From climate change to social change :perspectives on science-policy interactions. Utrecht : International Books. Harper, Charles L. (2012). Environment and society: human perspectives on environmental issues. Boston : Prentice Hall. Hastrup, Kirsten.Olwig, Karen Fog. (Eds.) (2012). Climate change and human mobility: global challenges to the social sciences. Cambridge. 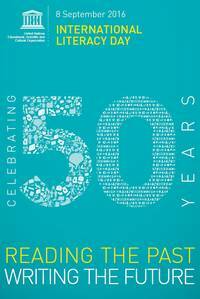 England : Cambridge University Press. O’Brien, Karen L., St. Clair, Asuncion Lera, Kristoffersen, Berit. (Eds.) (2010). Climate change, ethics and human security. New York : Cambridge University Press.